Did you host a DisneySide party? Leave a link to your party post below! Weren't able to host or attend a DisneySide party? Join my giveaway for a DisneySide goody bag below! 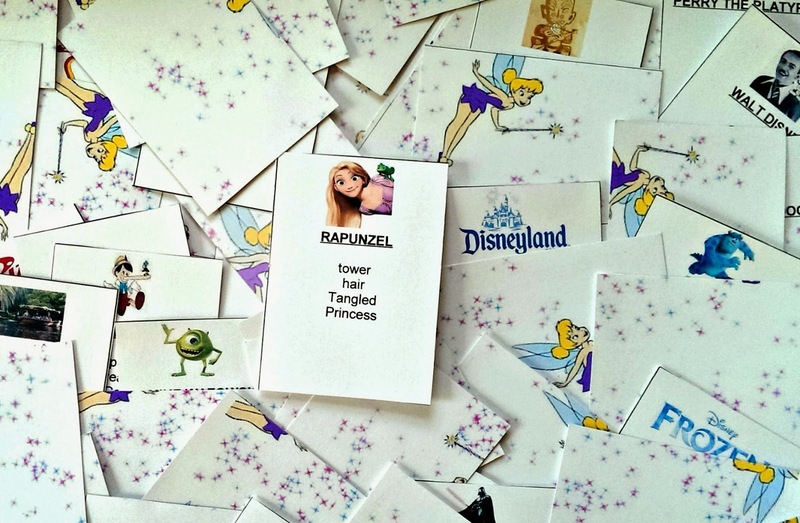 Making decorations for our DisneySide party couldn't be easier. All I did was trace out Mickey ear shapes onto black construction paper. You can find Mickey ear templates on the web, or use a Mickey cookie cutter like I did. I also printed out a few Mickey drawings and stuck them on the wall along with the Mickey ears. A red tablecloth and Mickey-themed partyware added the final festive touch. 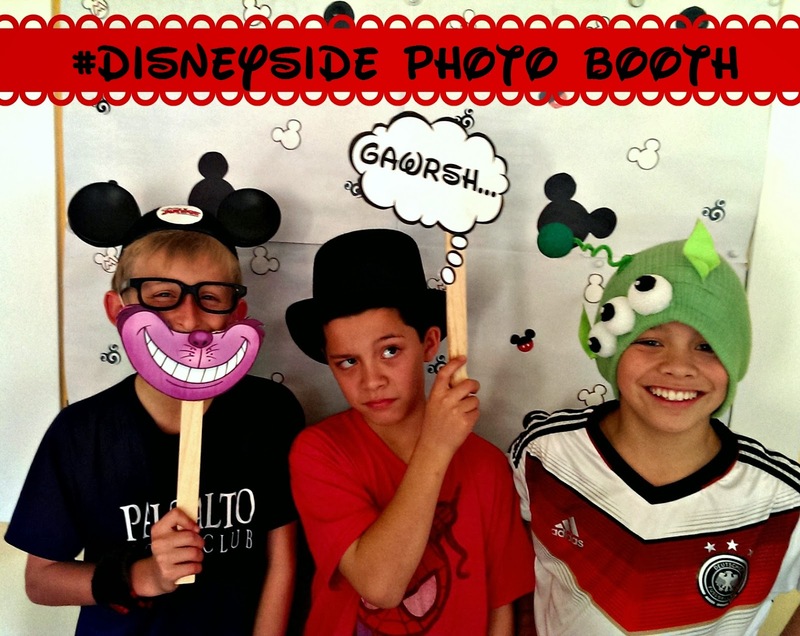 First party activity: our DisneySide photo booth! I gathered all the Disney-themed props I could find -- Mickey ears, Minnie headbands, the Toy Story alien hat that The Pea made last Halloween, some fake glasses, a boa, Alfie's Jack Sparrow hat, Mad Hatter hat, and top hat. I made a few more photo booth props from cardboard and paint sticks -- a fake mustache, a Cheshire cat grin, and some signs. I made a background by gluing Mickey ears onto large sheets of paper, and tacked it onto our message board. Then I let our guests choose their props and ham it up for the camera! Our second party activity was t-shirt decorating. Hanes sent us white t-shirts in our DisneySide @Home celebration kit, so each guest got to make their very own Disney shirt. I made some freezer paper stencils before the party, and each guest chose a design. I ironed the freezer paper onto the shirts, so all the kids had to do was dab paint onto the stencil. 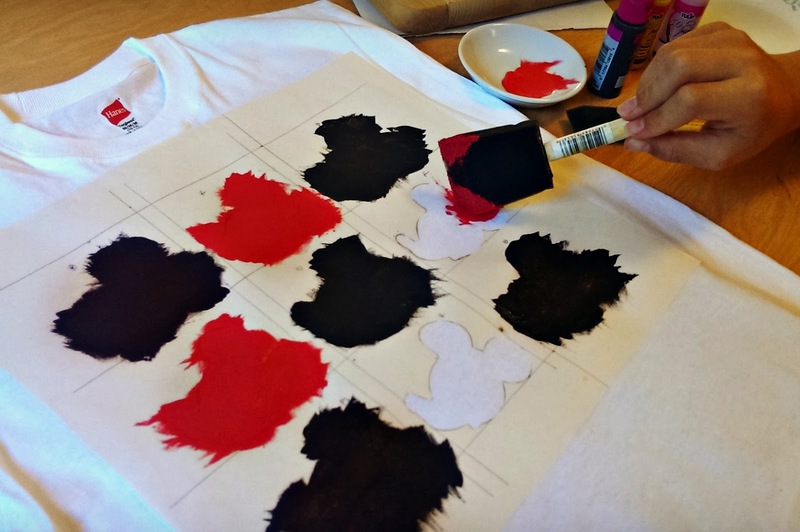 Once the paint dried, they peeled off the freezer paper and ended up with a design that looked like it had been silk-screened onto the shirt. The Pea and her friends decided to draw their designs on their shirt using the fabric markers provided in our party kit. 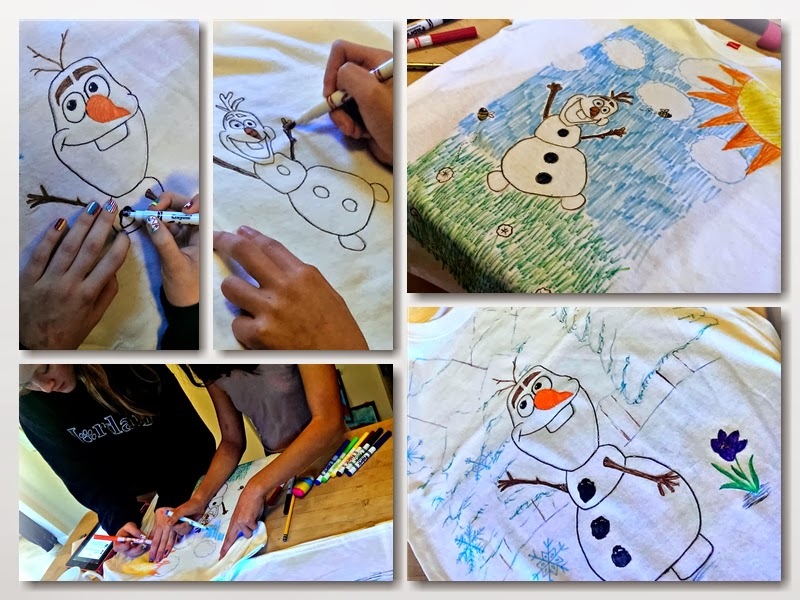 They looked up Olaf pictures online, then copied them onto the shirt, drawing freehand. I was amazed at how well their shirts turned out -- those girls are so artistic! Because the kids took such care with their designs, the t-shirt decorating activity took up much more time than I expected. Before we knew it, it was time to eat! 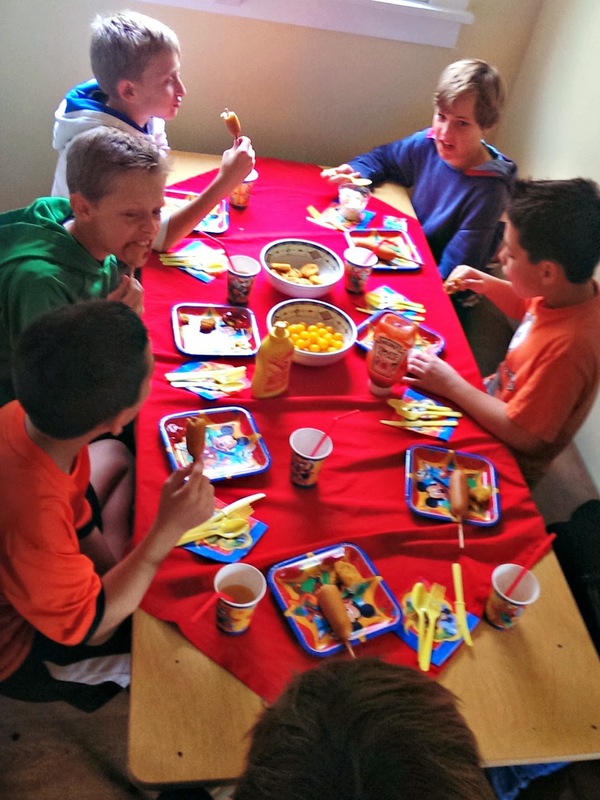 For dinner, the kids had corn dogs (a favorite Disneyland food) and cherry tomatoes. For dessert, I went a bit overboard with Disney treats! 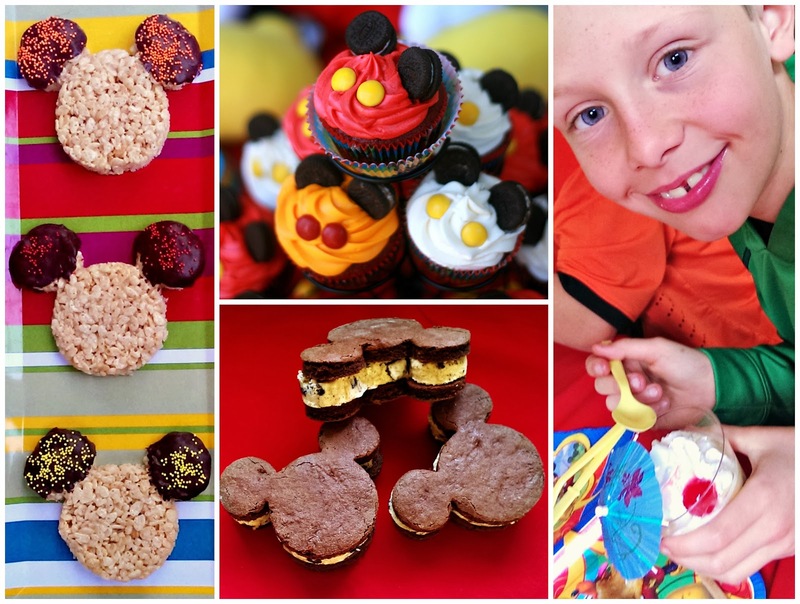 I recreated some of my favorite Disneyland treats: Dole Pineapple Whip, Mickey ice cream sandwiches, Mickey rice krispy treats, and Mickey cupcakes. They were so much fun to make, and tasted pretty darn close to the real thing. 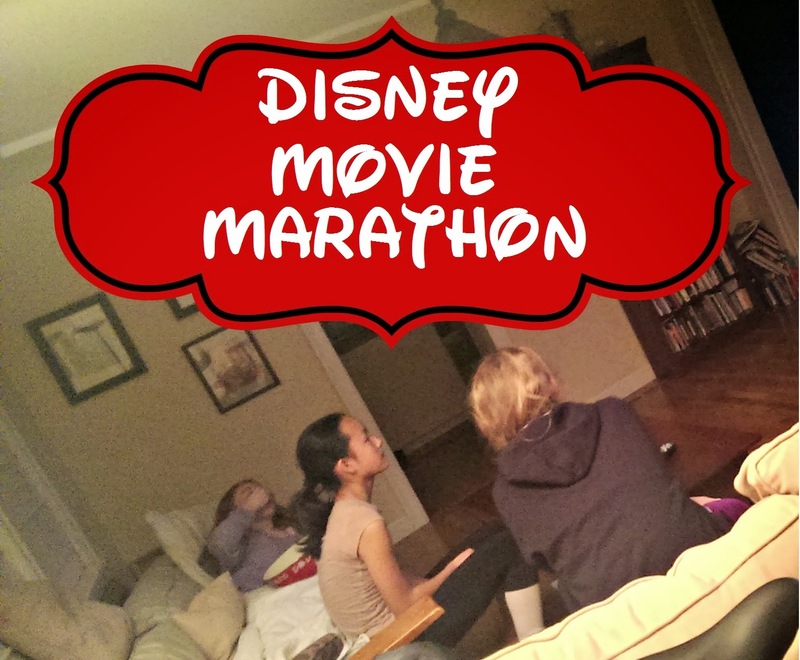 3Po's and Jammy's guests went home soon after, but the girls stayed for a sleepover, and began yet another activity: the Disney Movie Marathon! 3Po and Jammy joined them, and they stayed up late into the night watching Mulan and The Lion King. And what would a Disney Movie Marathon be without one of my favorite Disneyland snacks, popcorn?! Of course, we served it in special popcorn buckets with Mickey ears that I cut out and glued. I had planned to play some Disney-themed party games (Disney Trivia and Disney Taboo), but we ran out of time, so the next morning, while waiting for their parents to pick them up, the girls amused themselves by reading out Disney Taboo cards I made, as well as the Disney trivia cards included in our party kit. 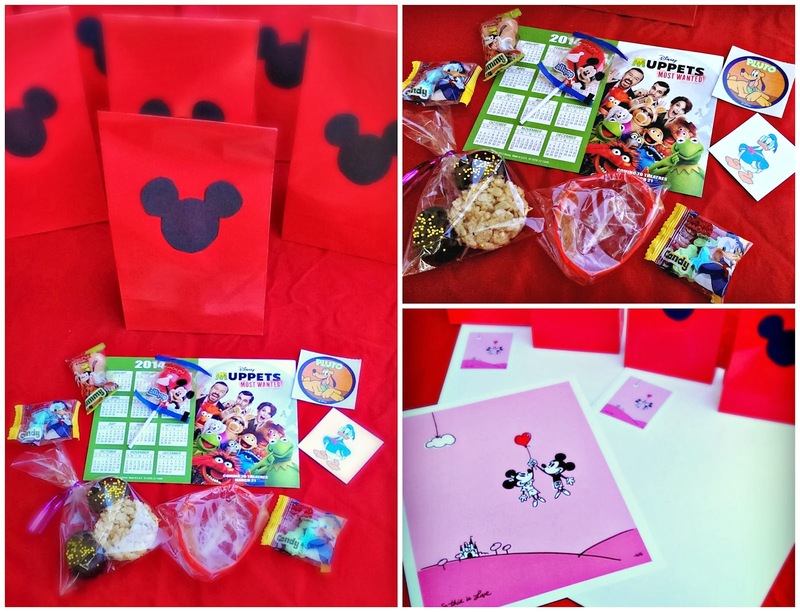 Check out our goody bag: a red paper bag decorated with Mickey ears, filled with runDisney bracelets, a Muppet Movie calendar, tattoos, and stickers that came in our party kit, along with some Mickey-themed pinata filler candy that I bought at our local party store and a mini Mickey rice krispy treat. The girls also got a cute Mickey & Minnie poster (I offered the posters to the boys but they weren't interested!). 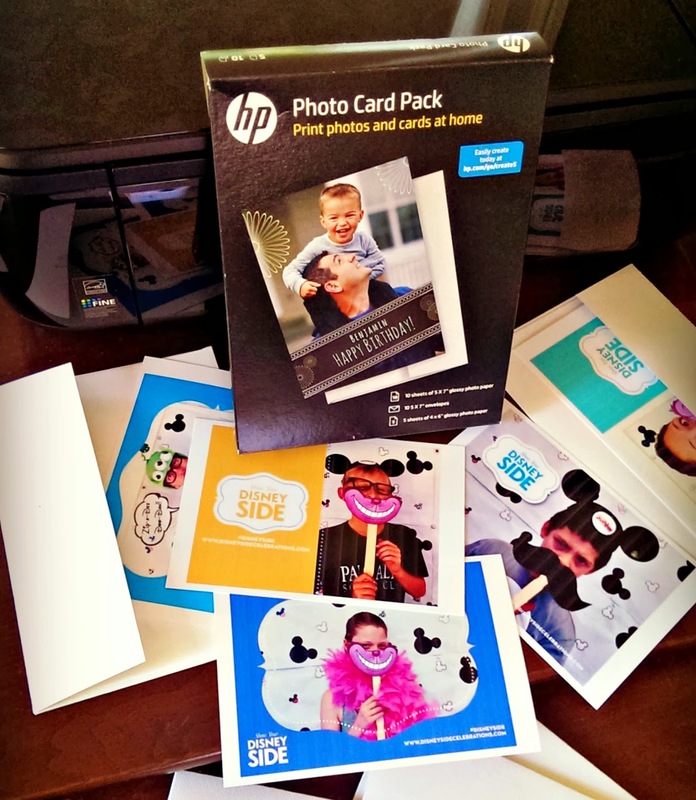 Finally, I printed out the photo booth photos on the HP photo cards that came in our party pack, so that each guest could have a fun keepsake of the party. You can find the DisneySide overlays that I used in the HP Photo Creations app, along with other fun designs. I was sad to see our DisneySide @Home celebration end. I have had so much fun planning and documenting all our preparations this past month, and it was a great way to share our love of Disney with my kids' friends. Thanks to Disney Parks, Mom Select, American Tourister, Hanes, HP, Ocean Spray for all the fun party goods and supplies! 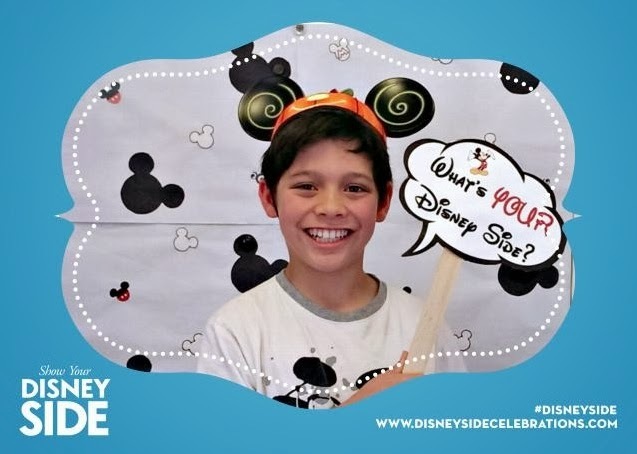 To celebrate their love of all things Disney, families across the country are hosting #DisneySide parties and letting their Disney Side shine. Follow the fun with the #DisneySide hashtag on Twitter, Instagram and Pinterest, and get inspiration to host your own DisneySide celebration with recipes, activity kits and tips on www.disneysidecelebrations.com/. How will you celebrate your DisneySide this year? 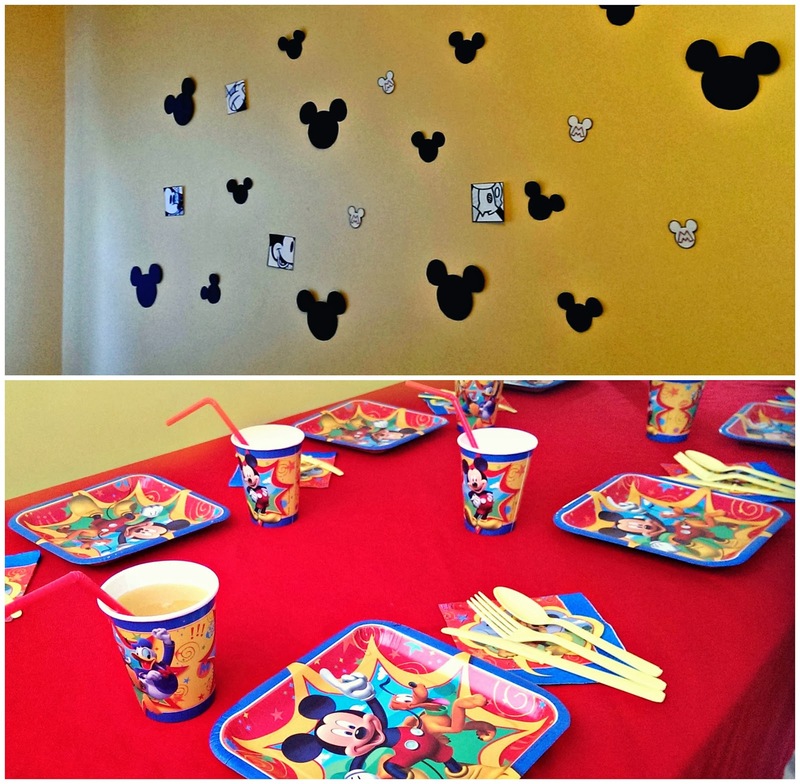 If you've hosted a DisneySide @Home Celebration, leave the link to your party post below! I'd love to visit your blog, check out your party recap, and ooh-and-ahhh over all the wonderful ways you celebrated your Disney Side! 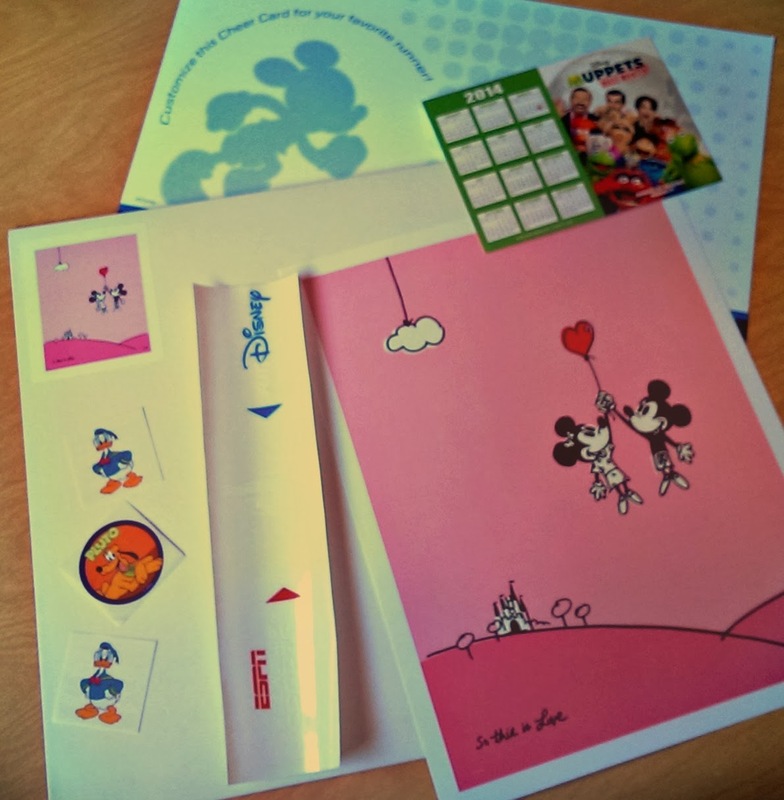 Two lucky Bonggamom Finds readers will receive an 11'x14" Minnie & Mickey poster, a runDisney sticker, a Muppet Movie calendar, a runDisney chEAR card (sorry I had to fold a portion of the card because it wouldn't fit in the mailing envelope! ), Disney temporary tattoos and Disney stickers. Leave a comment on this post and tell me how you show your Disney Side. This giveaway ends at 11:59PM PST on March 17, 2014; I will draw a winner at random on March 18 and post their name after they confirm acceptance. Continental US residents only. For additional giveaway rules, click here. Disclosure: I received free party supplies, goody bag fillers and other products to host a #DisneySide @Home Celebration. The views and opinions expressed here are my own. We all love watching Disney on Ice performers twirl and glide through their musical numbers -- but for my daughter, the performance takes on a special significance because she took skating lessons for years, from the time she was in first grade. She fell in love with skating from the first moment she stepped on the ice, and even though she was slipping and sliding all over the place, she was determined to get better... and she did. 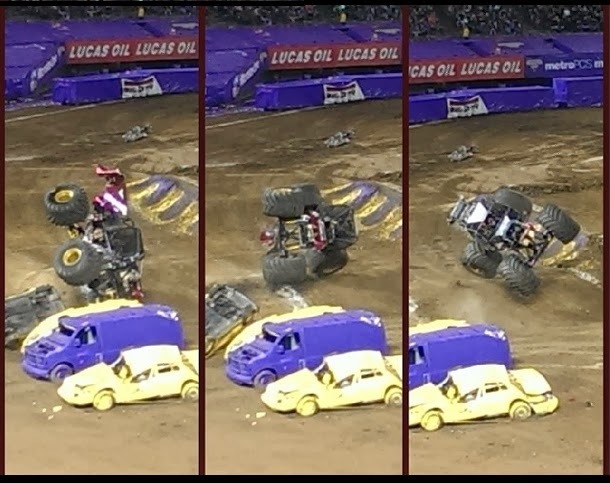 I was so proud of the The Pea for working hard and getting from pre-alpha level to level 2 freestyle! Unfortunately, she chose to stop taking skating lessons in order to concentrate on her dance lessons, but she still loves to skate. The performers at Disney on Ice make it all look so easy, but only someone who skates knows the talent and hard work required! How old were you when you began skating? My elementary school took a field trip to our local ice arena, and it turned out I picked it up pretty quickly. My parents asked if I wanted lessons and I said, "sure! With this company, I would love to progress from an ensemble skater to a step out or principal skater. Personally, once I am finished touring, I would like to go back to college and earn a degree. I love seeing hundreds of little kids all dressed up a various Disney characters and absolutely loving the show! How would you describe your skating style? What do you want the audience to get from your performance? How long have you been with Disney on Ice? I have been skating with Disney on Ice for just over 1 year. What's it like to audition for a role with Disney on Ice? 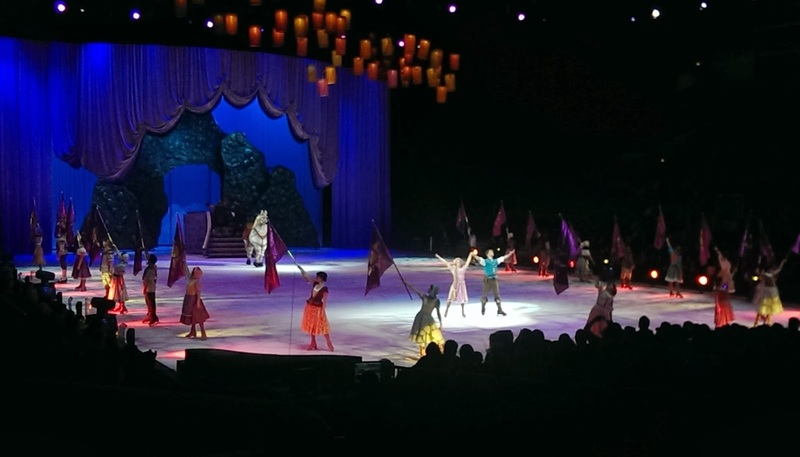 Auditioning for Disney on Ice was a very fun experience for me. My first step in the auditioning process to make a video to send to the Disney on Ice. The video was a compilation of clips from past competitions and performances I had skated in, showing my skills and performance level. Then I was invited to do a live audition at the Oracle Arena in Oakland. This was fun because I got to audition with my sister, Carmen, and it was so great to have her with me for moral support! 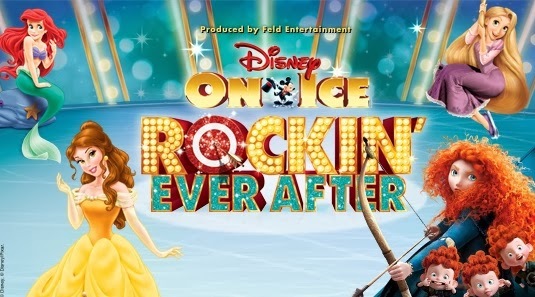 What role do you play in this performance of Disney on Ice presents Rockin Ever After? On our show, Rockin' Ever After, I am an ensemble skater, which means I get to perform in all the group numbers and support our princesses and other main characters. What do you like best about the role? What I love best about being an ensemble skater is that I get to participate in so much of the show! There are so many fun group numbers on our show and I get to be a part of almost every single one of them. I love the variety and excitement being used in so many different segments of the show. How many days of the year do you travel with the company? On our show we are scheduled to travel roughly around 10 months out of the year. How long do you rehearse for a performance? At the beginning of our tour we rehearsed for several weeks, learning choreography and polishing what we had learned. Now that we are on tour we mostly just have rehearsals for tuning up and cleaning. What do you and the other performers do during your free time while on a tour? On our time off we all have different things we like to do with our free time. I like to go sightseeing and find good local eateries. Some people like to find a yoga studio or art gallery in every city, and others just rest and recover from our rigorous weekend of performing. What advice do you have for a young skater who dreams of performing with Disney on Ice? My advice for young skaters who have dreams of joining Disney on ice is to take an acting class or two. Not many people realize how much acting goes into our job. A huge part of what we do is telling stories throughout dialogue scenes, as well as showing emotion/telling stories while we skate. Feeling comfortable while acting would be a useful skill to have before joining tour. What an inspiration for young skaters out there! 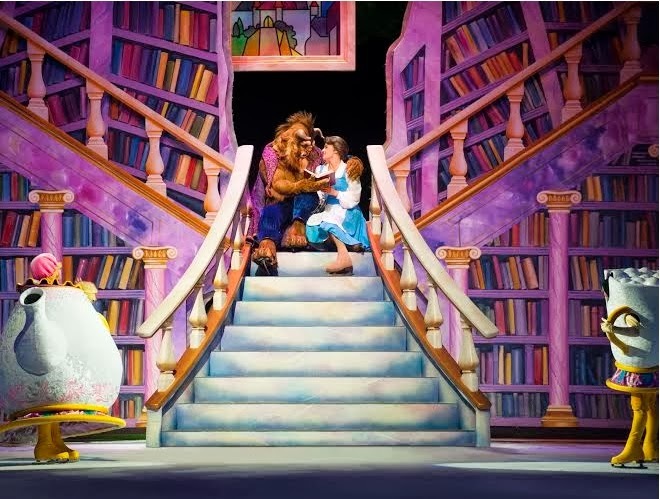 Disney On Ice presents Rockin’ Ever After played at SAP Center in San Jose from February 19-23. The show is moving to the Oracle Arena in Oakland from February 26-March 2. Disclosure: I am a Feld Family Ambassador, and in exchange for my time and efforts in attending shows and reporting my opinion within this blog, as well as keeping you advised of the latest discount offers, Feld Entertainment has provided me with complimentary tickets to Feld shows and opportunities to attend private Feld pre‐Show events. The views and opinions expressed here are my own. 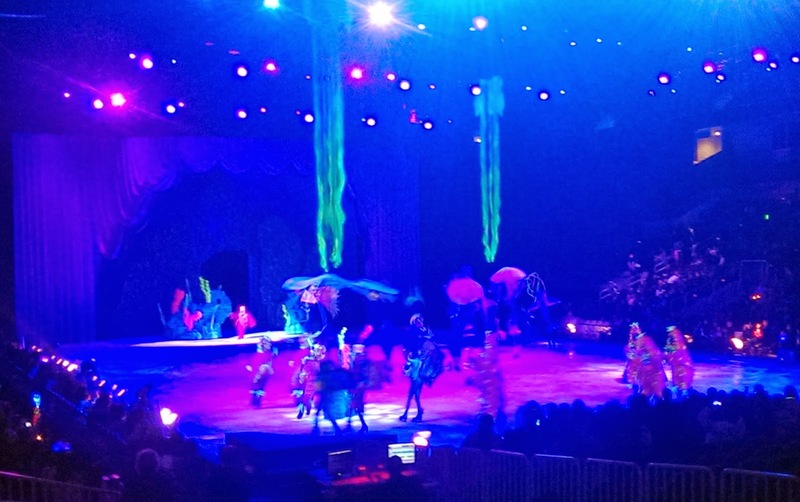 Disney on Ice is back in the Bay Area, and boy is it rockin'! 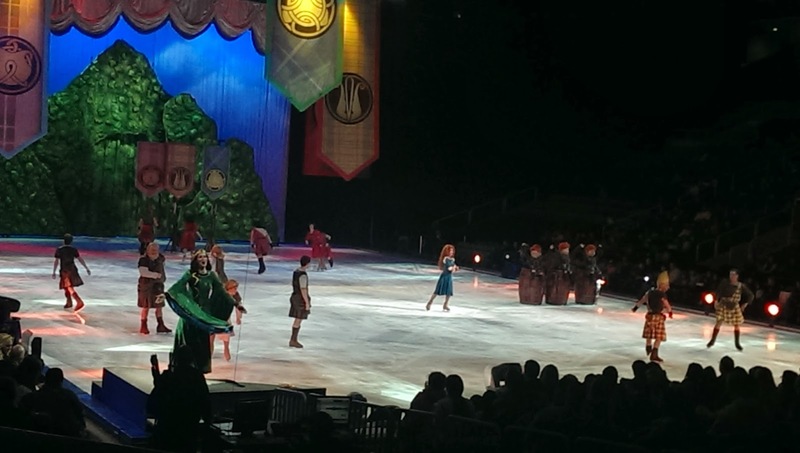 The boys and I attended the opening night show of Disney on Ice presents Rockin' Ever After, and we had a great time! The show features 4 of Disney's best-loved princess tales: The Little Mermaid, Beauty and the Beast, Tangled, and Brave. 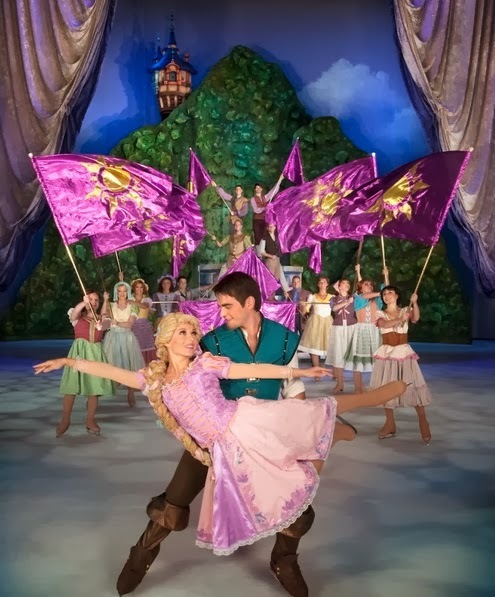 In this 2-hour show, Disney on Ice skaters bring the movies to life on the ice, skating to songs from the movies and reenacting a condensed version of the story. The fun starts with Mickey, Minnie, Goofy and Donald skating onto the ice and introducing a series of short performances by Pinocchio, Cinderella's sisters Anastasia and Drizella, and Ariel's six sisters along with Sebastian. I loved watching Ariel's sisters skate to a medley of tunes from my teenage years including Vogue and Girls Just Wanna Have Fun! After Ariel's sisters performed, Sebastian started looking for Ariel, which led to the Little Mermaid portion of the show. Even though we've seen The Little Mermaid performed on ice several times before, Disney on Ice constantly tweaks the costumes, props, and choreography to keep things fresh. Next on the program was the story of Beauty and the Beast. In past years we've seen Belle and the Beast skate to Tale As Old As Time, but have never seen the whole story reenacted on ice. The scenery and props for this segment were amazing! I was really impressed by how they were able to recreate Belle's village, the Beast's library, and Gaston's pub. They even had real flaming torches for the Kill The Beast musical number. Enjoyable as the first half of the show was, I was even more excited to watch the second half because everything was new to me. After intermission came Tangled, the story of Rapunzel and Flynn Rider. Again, I was impressed by their clever usage of props like huge flags, the floating lanterns and Rapunzel's tower. Somehow, they were also able to get Maximus the horse and all the thieving thugs dancing and twirling on the ice -- with frying pans, no less! The final quarter of the show featured the Disney-Pixar movie Brave. I was wondering how they would port the story of Merida onto the ice, because it's not a musical, but they managed to do it quite well. It started with Mickey Mouse opening a book and beginning Merida's story, then gradually switched over to a narration from Merida's point of view. The two main musical numbers were Merida skating to Touch The Sky, and the archery tournament, set to lively Scottish music. I love Scottish music, so I enjoyed both numbers immensely -- in fact, right after the show I downloaded "Touch The Sky" onto my phone! It's going to make a great addition to my Disney-themed running playlist! Of all the 4 stories, Beauty and the Beast seemed the most complete. If you haven't watched Little Mermaid, Tangled or Brave, you might have a bit of trouble following along, because the show leaves out key elements of the 3 stories. (Ariel & Eric defeating Ursula, cutting Rapunzel's hair, Merida turning her mom into a bear and pretty much the entire second half of the Brave movie). 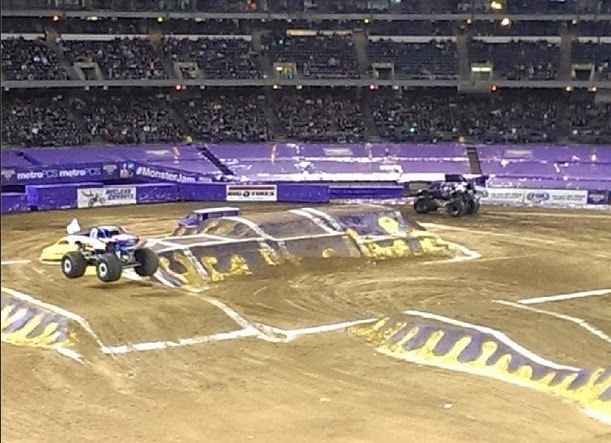 I'm sure it was a challenge fitting 4 stories into a single show! 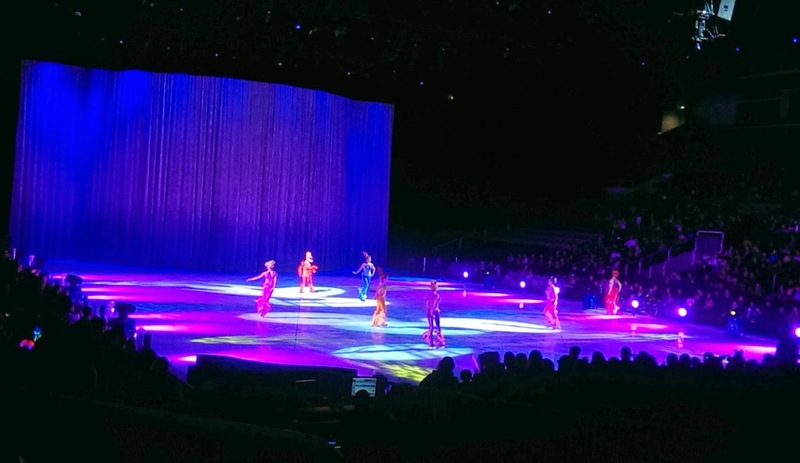 I think Disney on Ice did a great job, and this production is one of the best Disney on Ice shows I've seen in recent years! It's playing tonight and tomorrow at the SAP in Center in San Jose from February 19-23 and Oracle Arena in Oakland from February 26-March 2. Don't miss it! Disclosure: : I am a Feld Family Ambassador, and in exchange for my time and efforts in attending shows and reporting my opinion within this blog, as well as keeping you advised of the latest discount offers, Feld Entertainment has provided me with complimentary tickets to Feld shows and opportunities to attend private Feld pre‐Show events. The views and opinions expressed here are my own. Disclosure: I participated in a campaign on behalf of Mom Central Consulting (#MC) for Mom Corps YOU. I received a free trial to facilitate my review and a promotional item as a thank you for participating. The views and opinions expressed here are my own. My youngest will enter middle school in just two years! How time flies. Once that happens, my kids won't need me as much as they used to, so it will soon be time to start reevaluating my personal and career goals. Right now I work at home part-time, but I would love to ramp up my work hours -- but it has been over 10 years since I stopped working full time! What's more, I've discovered that my passion no longer lies in software product marketing. What I really enjoy doing now is connecting brands to people and working with families. At this point I feel unequipped -- in both skills and confidence -- to rejoin the work force! That's where a resource like Mom Corps YOU comes in. Moms Corps YOU is a subscription-based community launched by Mom Corps, the national award-winning professional talent acquisition and career development firm. I was given a free trial subscription to Mom Corps YOU, after just a couple of weeks of looking around the site, I've already found so many useful resources to help me prepare for my next stage in life! 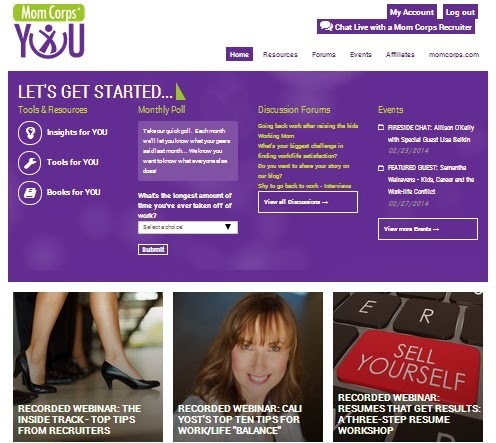 Mom Corps YOU holds webinars on Tuesdays and Thursdays, covering topics such as resume building, what to do during your gap years, social media strategies for your next career, and work-life balance. They also feature conversations with working women from all industries. You can watch the webinars live or watch recordings later (you'll need to install the Silverlight plugin). Mom Corps YOU has gathered resources from industry leading publications and news with lots of tips and advice. They also have a recommended reading list on topics ranging from Careers to Finance, Health & Wellness and Entrepreneurship. Community members can also weigh in with their experiences and advice in the discussion forums. I'm loving the discussion forum topics -- many are directly relevant to my stage of life, such as "Going back to work after raising the kids", "Shy to go back to work", and "Working Mom". You can even chat live with a Mom Corps Recruiter who will answer your career-related questions! Mom Corps YOU has compiled an arsenal of tools to help you advance your career: templates for resumes, post-interview thank-you letters and business plans, sample interview questions, business ideas checklist, training videos, and more. Since I'm currently updating my resume, I'm finding articles like "Resumes that Get Results" especially useful, along with the Sample Interview Questions to prepare me for the interviews I know I have to face. I'm also loving the LinkedIn guide that goes through the basics of LinkedIn and how to utilize it to help your career. Mom Corps YOU is available via an online subscription for an introductory annual price of $99.99 (regularly $149.99) or $19.99 a month. Check it out at www.MomCorpsYOU.com -- it's a great resource for women, whether you're seeking personal or professional development! When it comes to home decor, sometimes the smallest things can make the biggest impact. Softsoap recently sent me samples of their new Decor Collection liquid hand soap line and challenged me to dress up my sink with them. 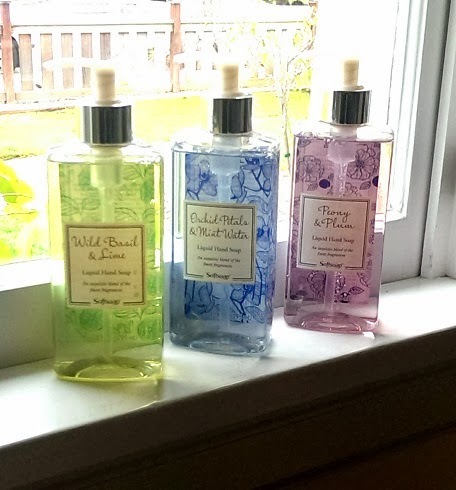 The Decor Collection line comes in three scents -- Peony & Plum, Orchid Petals & Mint Water, and Wild Basil & Lime. Each one smells heavenly, and each one is packaged in beautiful decorative bottles so you don't need to transfer the soap to another container. I decided to use the new Softsoap Decor Collection to freshen up the look of our downstairs bathroom. Usually, the countertop is a mess. The photo on the left shows the state of our bathroom on a good day -- a red floral display (that clashes with the bathroom's color scheme!) that I added one Christmas three or four years ago and never bothered to remove, ugly plastic liquid soap dispenser (because I can't be bothered to pour the liquid soap into a nicer looking container), two soap dishes (we never use solid soap anymore so I have no idea why they are on the countertop), nail files and other junk that the kids use and leave in their place. This SoftSoap challenge couldn't have come at a better time! The first thing I did was replace the red accent piece with a blue-green one. Our sink is lined with decorative tiles that have a feather motif, so I put two peacock feathers in a small stem vase. Then, I cleaned up the random items on the countertop -- put the nail files and hair gel in a drawer, put the glass bowl back in the kitchen, got rid of the soap dishes. I also replaced the hand towel with a fresh one in a mint green color. I added a scented candle and a bottle of Softsoap Decor Collection, and in just five minutes our bathroom looked cleaner and prettier. 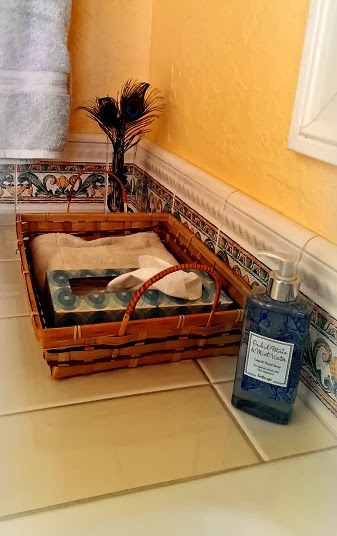 The Softsoap Decor Collection really does enhance our bathroom decor! The bottle has a simple, clean look, and you can select which soap you use based whether you want the soap color (green, blue, or lavender) to blend or stand out with your bathroom's color scheme. Of course, you can also select the soap based on which scent you love the most! 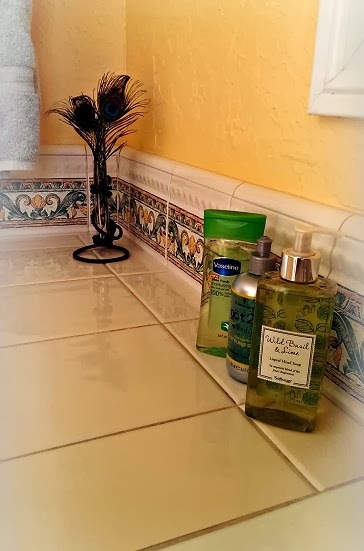 My personal favorite is the Wild Basil and Lime, which smells heavenly and happens to blend really well with the green accents on our decorative tiles. By the way, I love how the shiny silver accents in the label and the pump top go so well with the chrome finish of our taps and towel bars. 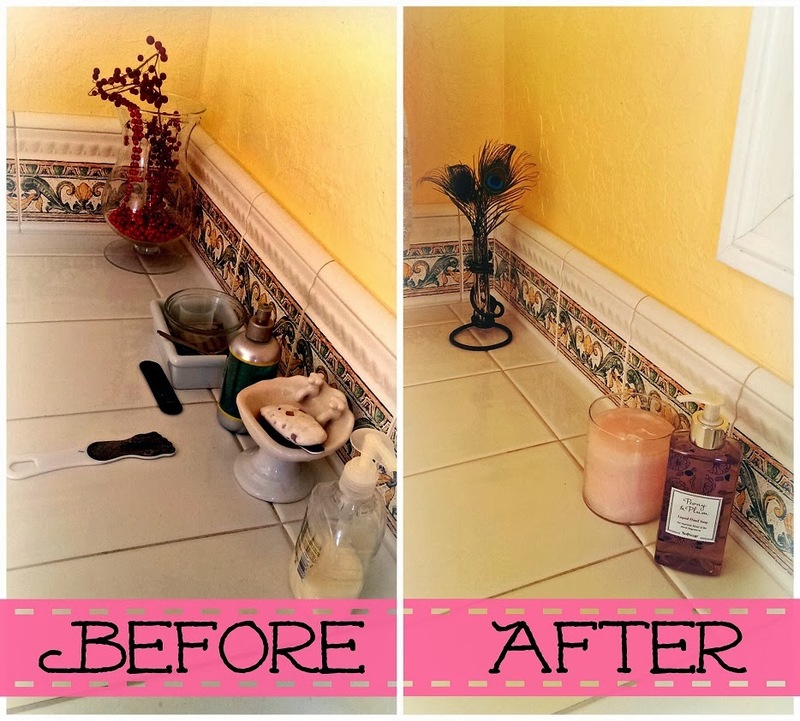 If you must have items like lotions or creams on the countertop, just line them up for a nice, neat look. To make your countertop look even more organized, you can place loose items in a basket. This setup will look so nice for our guests the next time we have someone spend the night! Softsoap's new Decor Collection liquid hand soap line is available at Target, Walmart, CVS, Rite Aid, and large Food stores for a suggested retail price of $2.49 for a 10 fl.oz. bottle. 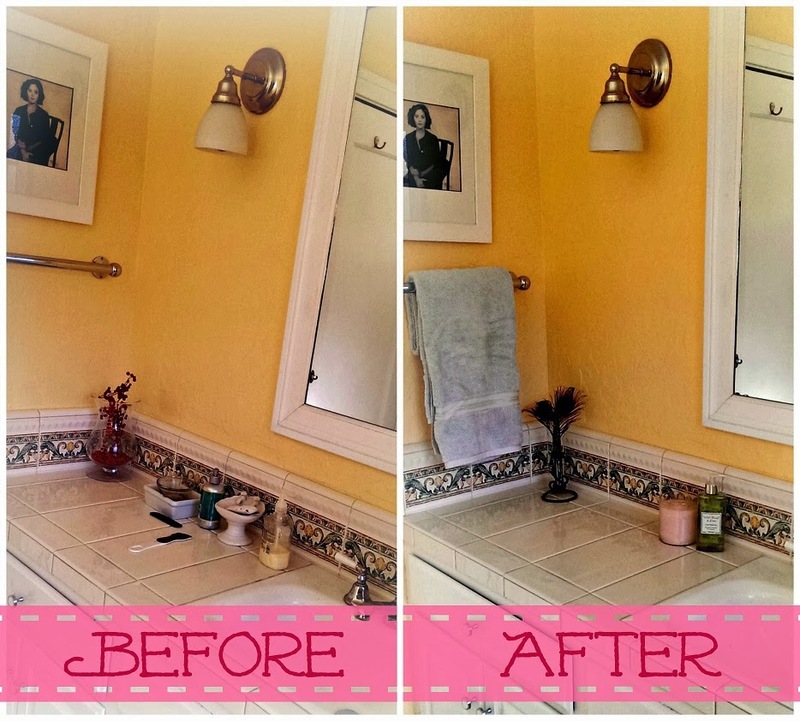 It's amazing what a $2.49 bottle of soap can do to inspire you to beautify your bathroom sink! Leave a comment on this post and tell me your which scent in the Decor Collection line you would most like to try. This giveaway ends at 11:59PM PST on March 7, 2014; I will draw a winner at random on March 8 and post their name after they confirm acceptance. Continental US residents only. For additional giveaway rules, click here. Disclosure: I received sample products from Colgate-Palmolive for review and giveaway. The views and opinions expressed here are my own. Who doesn't know the Peace sign? It has become a fashion and design icon, appearing on everything from tshirts to notecards to teddy bears' tummies. Peace is a good thing, and pretty much everyone says they want it... but only a few companies actually put their money where their mouth is and do something concrete to promote peace. Kiss My Face is one of those companies. I love their Peace soaps! They smell heavenly -- from my favorite Lavender Mandarin scent to the new Pomegranate Acai scent that Kiss My Face recently sent me -- and they are simple, gentle castile soaps so I know my kids' sensitive skin won't get irrirated. But the peace sign is more than just a cool design. For 5 years now, this healthy body care company has partnered with Seeds of Peace to develop leadership skills in young people living in regions of conflict. 10 % of all profits from Kiss My Face's Peace soaps supports Seeds of Peace! To celebrate their 5th year of partnership, Kiss My Face is offering 25% off their Peace Soaps. Also, they have set up a donation matching program -- they will double your donation to Seeds of Peace up to $30,000! It's a win-win for everyone! It’s a kiss-a-bration! For 5 years now, Kiss My Face has been spreading peace through its partnership with Seeds of Peace, an organization that aims to develop relationships and leadership skills among young people from regions of conflict. 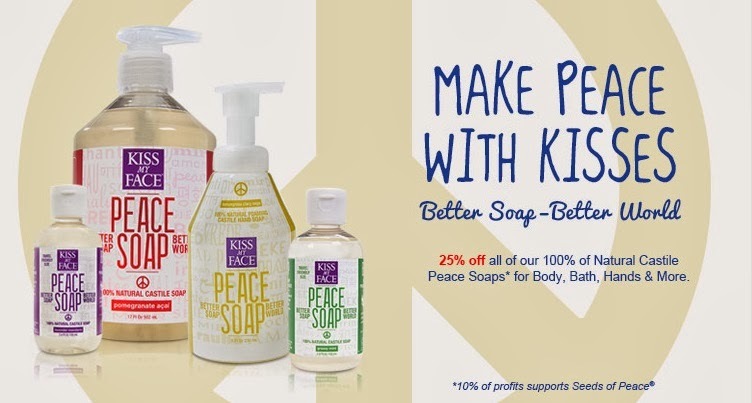 Kiss My Face supports Seeds of Peace by donating 10% of all profits from Peace Soap to the organization. To celebrate the 5 year mark, Kiss My Face is offering 25% off all Peace Soaps when purchased online at kissmyface.com, for a limited time. 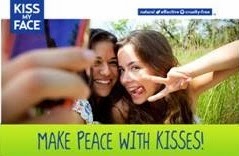 Kissing is one of the best ways to bring about peace – naturally. Kiss My Face Peace Soap is a castile soap formulated with 100% natural ingredients including olive, coconut and jojoba oils. Castile soap is a safe and gentle substitute for traditional soaps that often contain harsh ingredients. This simple Kiss My Face formulation is biodegradable, environmentally friendly and can clean just about anything! Peace Soap is available for $2.99 (3.4 oz), $6.49 (8 oz) and $8.99 (17 oz) at Whole Foods, Natural Supermarkets, KissMyFace.com and wherever natural body care products are sold. Seeds of Peace brings teenagers together from opposite sides of conflict for one of a kind leadership and conflict resolution training. At a camp in Maine, youth who would otherwise be “enemies” instead learn to live and talk with “the other side.” They return to the Middle East, South Asia and communities across America as more compassionate, understanding and more tolerant peace makers. By planting these “seeds of peace” they hope a brighter and more peaceful future will flourish. Disclosure: I received a product sample to facilitate my review, but have not been paid to review the product or give my opinions. Product information (in italics) is provided by Kiss My Face. The views and opinions expressed here are my own. How is your year starting out? NCircle is pleased to kick off the new year with two brand new DVDs: Dino Dan's Tyrannosaurus Trek and The Wiggles' Furry Tales. They're a great way to get your child moving, grooving, and learning with his or her favorite TV characters! Check out the DVD descriptions below, and enter to win both DVDs plus a fun Wiggles Musical Guitar! In these five brand new episodes -- which have never aired in the U.S. -- dino fans learn about how dinosaurs lived and thrived in the prehistoric era through the eyes of Trek, Dino Dan's younger brother. The DVD includes a brand new 3D dinosaur which can be scanned using a free app; dinosaur fans can see a massive Gigantosaurus come to life! This DVD is now available exclusively at Walmart. In the Wiggles' latest DVD, the beloved band from down under offers tons of catchy music that young fans will love along with a few new faces, including the first ever female Wiggle, Emma the Yellow Wiggle! The DVD features over 21 songs that celebrate their animal friends and includes footage of Bengal tigers, kangaroos, dingos and other exotic animals from the Dreamworld Wildlife Park in Australia. 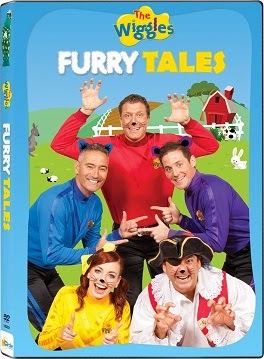 The Wiggles' Furry Tales will be available in stores everywhere on February 27. 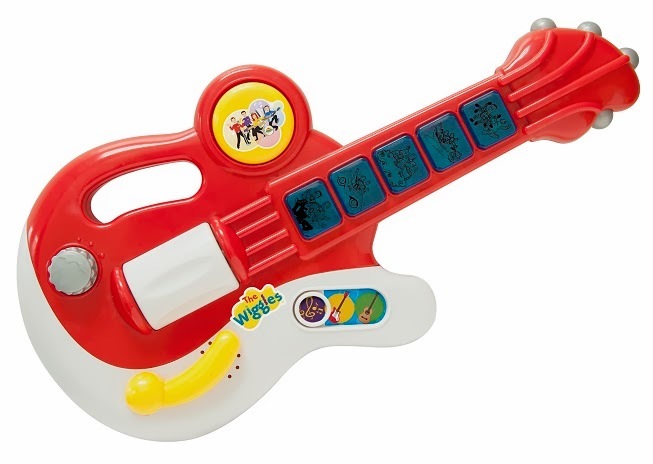 A Wiggles Music Guitar worth $17.99! This giveaway is only open to fans of the NCircle Entertainment Facebook page, so "like" NCircle Entertainment on Facebook before you join! Like NCircle Entertainment on Facebook AND leave a comment on this post and tell me your favorite Dinosaur OR your child's favorite Wiggles character. This giveaway ends at 11:59PM PST on March 3, 2014; I will draw a winner at random on March 4 and post their name after they confirm acceptance. Continental US residents only. For additional giveaway rules, click here. Disclosure: Thanks to NCircle Entertainment for providing a prize pack to give away, plus a second prize pack for me. Product information (in italics) is provided by NCircle Entertainment. The views and opinions expressed here are my own. 1) Give incentives such as star stickers or little toys when a child completes a week of brushing. 3) Read stories to kids about their favorite characters brushing their teeth or visiting the dentist. 4) Let kids choose their own toothbrush and toothpaste with their favorite characters (like the adorable Dinosaur Train tooth brushes below!) and fun flavors. 4. Get the hard to reach places: Floss your teeth at bedtime. 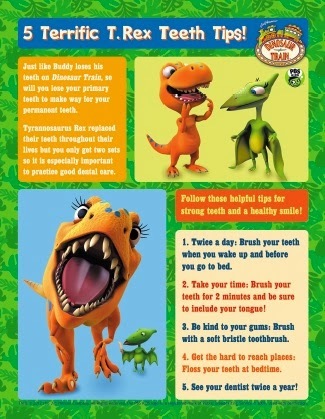 Here's a cute Dinosaur Train poster containing the tips above. Download, print, and show the poster to your child to make sure those tips stay on his mind! To help your preschooler get more comfortable with the world of teeth, Little Golden Books has a great Dinosaur Train book: Buddy's Teeth, the book version of the tv episode where Buddy loses a tooth! It's available wherever books are sold, SRP: $3.99. 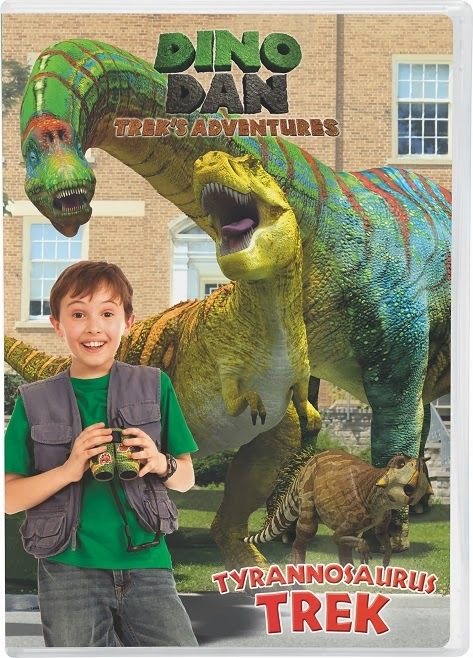 The new DVD Dinosaur Train: I Love Dinosaurs. Leave a comment on this post and share a tip to help young children develop good brushing habits. 8) Follow Dinosaur Train, The Jim Henson Company, Random House Kids and PBS KIDS on Facebook or Twitter -- 1 entry per social media network you follow! This giveaway ends at 11:59PM PST on March 1, 2014; I will draw a winner at random on March 2 and post their name after they confirm acceptance. Continental US residents only. For additional giveaway rules, click here.